My original notes on this recipe, or rather my scribbled reminder says Salmon, Chickpeas, Prawns and Harissa – a bit of a mouthful I thought – so Fish Stew with Harissa it is, more casual anyway which I prefer. The name doesn’t however, convey the fabulousness of this dish, rich, sweet and pink by way of the salmon and prawns, chilli spiked and spiced from the harissa and filling, in a good way, with the chickpeas. I had promised I wouldn’t mention the weather again but it seems, I can’t stop myself and unable to wait any longer for Spring to arrive I decided to cook something sunny instead. I wanted something redolent of lunch by the sea, toes in the sand, a bottle of white wine in an ice bucket, a plate full of fish and spice to eat with some good crusty bread on the side to mop up the sauce. Back to reality then, this is an easy weekday supper. 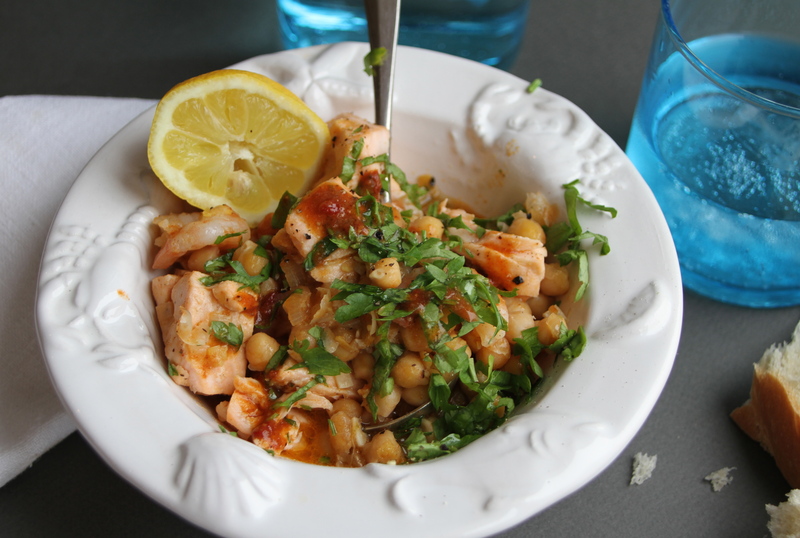 The chickpeas simmer in the wine and harissa which form a fragrant broth to cook the fish in. It sits happily on the hob whilst you do something else and then ta, da, a delicious healthy supper appears with almost no effort at all. This is enough for 2 but is easily doubled. Heat the oil in a large frying pan and cook the onion gently until soft, add the garlic and stir for a few minutes. Then add the harissa followed by the white wine and stock. Mix this together then add the chickpeas, half a teaspoon of salt and simmer for 20 minutes. Put the salmon into the pan and cook for a further five minutes turning the pieces over half way and adding the prawns for the final few minutes of cooking. Add the lemon juice and taste, you may need more lemon or salt. Strew with parsley and serve. Note – I like this reasonably spicy so use two teaspoons of harissa, if you wish to be a little more cautious, add one and a half and then after tasting at the end swirl the extra through before serving if you want. Also, I find recipes with chickpeas need a fair amount of salt but do reduce the amount if you wish. I have been reading a lot recently about the benefits of alternative ingredients, spelt and buckwheat instead of regular flour, agave nectar and honey in place of sugar etc. I’ve already reduced the sugar in my normal brownie recipe, use maple syrup and or/honey in my granola and so on. Little steps but I don’t want to simply throw out all those recipes that we love – I can just do a bit of tinkering here and there. I often make spelt bread and like its earthy slightly nutty flavour but was a little apprehensive about cake baking with it, how would it behave, would it rise, would it be heavy? Well, what a marvellous surprise, these little cakes are fluffy and light, rose perfectly and are a real treat. We have chocolate left over from Easter and an open packet of amaretti biscuits I was keen to use which is what gave me this idea. I crumbled some of the amaretti over the top of the cakes as you can see in the picture and also crushed a few and added them to the batter before baking. They add a nice extra dimension and texture but if you really want that almond hit you might add a couple of drops of almond extract. 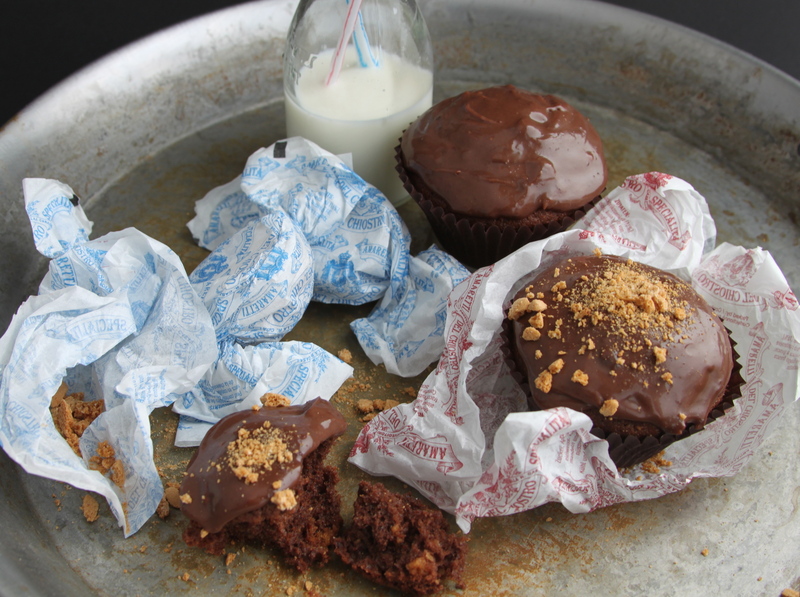 Or, I hear myself think, perhaps add some Amaretto to the icing (grown ups only)…. Alternatively dispense with all things almondy and make them simply chocolate if you prefer. Anyway, here they are, the cakes themselves are not seriously sweet but taste just right when combined with the chocolate ganache topping and am I right in thinking these almost qualify as health food…..
Preheat the oven to 180 and put 6 large (muffin rather than fairy) cake cases on a bun tin. Cream the butter and sugar together until light and fluffy, add the eggs and then sift in the flour, cocoa and baking powder. Mix in the milk and add 4 crumbled amaretti if you are using them. Divide the mixture between the cases and bake for 15 minutes. Leave to cool on a wire tray. For the topping melt 25g dark chocolate, 25g milk chocolate and 4 tablespoons double cream, mix together and leave to cool and thicken. Spread over the cakes and sprinkle over the remaining 2 crushed amaretti if using. Makes 6. I don’t know if it is twinkly eyed Paul Hollywood who has got us going or if we just want to make our own so we know exactly what we are eating but everyone is making bread. Yesterday I was collecting my children from a friend’s house when I realised I would be a couple of minutes late because I had a loaf in the oven. When I arrived to pick them up and explained my delay, my friend said she too had a loaf cooking. I must admit to using the big mixer often for kneeding my dough, not that it is in anyway arduous but just a matter of time – while that is chugging away I can be getting on with something else. Time is the main consideration when making a loaf of bread. For sure, putting ingredients in a bowl and mixing them is easy but before you start think about when you want to eat it. I have on occasion had to go to bed later than planned to allow for the second rising and then the cooking. Equally, you can’t start making it much less than three hours before you want to eat it. Unless you make my seedy soda bread. There are times when you need to produce an almost instant lunch from ingredients you have to hand and also times when you just want to rustle up a loaf of bread pronto and this is just the ticket. 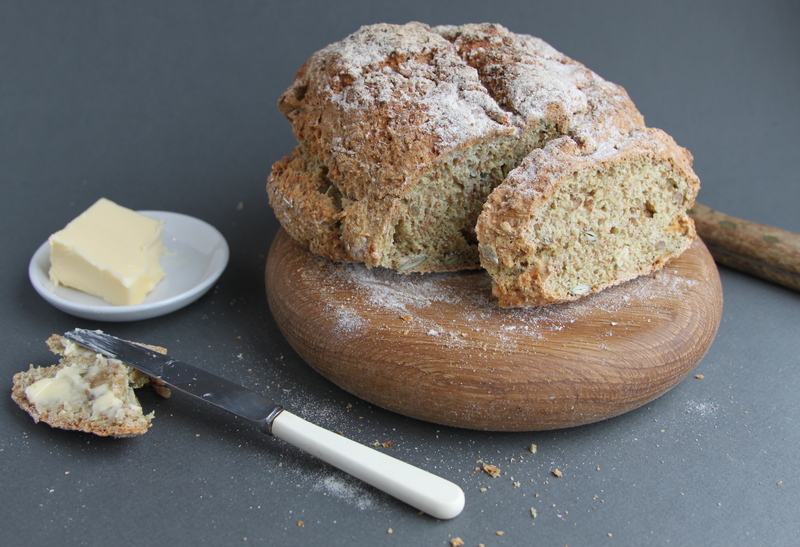 No kneeding, no proving, almost no work at all and yet – when it comes out of the oven, the smell, the feel, the taste of it….. Such a monster result for minimum effort. You can find tubs of buttermilk fairly easily in the shops usually next to the cream or creme fraiche. Failing that yogurt thinned down with a little milk will work just as well (aim for 250ml yogurt thinned with milk to just shy of 300ml). You can use wholemeal or white flour, I tend to go for a mix of the two. Partner this heavenly loaf with some soup and cheese for a truly good lunch and bask in the glow of your homemade bread. Preheat the oven to 200. Lightly toast the seeds in a frying pan until just beginning to colour and leave to cool a little. Put the flours, salt, bicarb, sugar and seeds in a large bowl and mix. Add the buttermilk and give it a good mix together. Sprinkle some wholemeal flour on a baking sheet, make the dough into a ball, put on the tin, sprinkle a little more flour over and cut a cross in the top with a sharp knife. Bake for 30-35 minutes until crusty, golden brown and sounds hollow when you tap the bottom. If it lasts beyond lunch, this makes great toast and is also unbelievably good spread with a little horseradish and topped with smoked salmon. 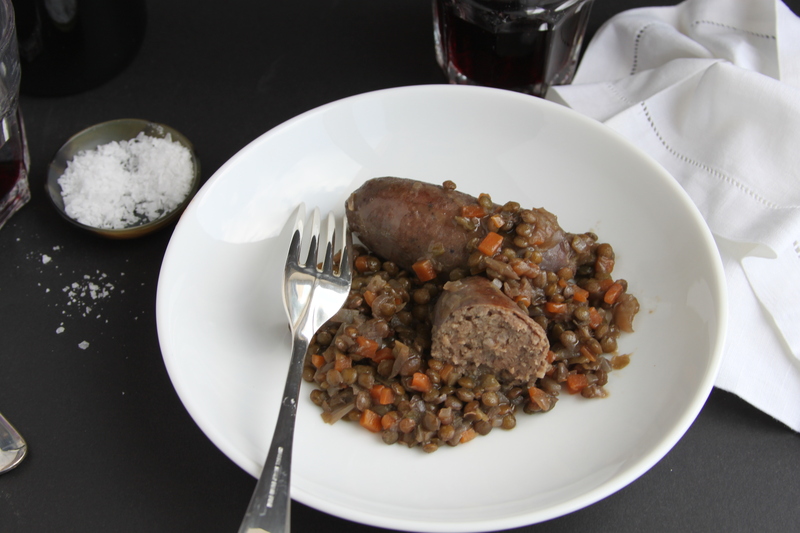 I don’t really know what to call this, sausages and lentils seems a bit bald, uninspiring really and in no way conveys the lip smacking cosiness of it. Also, I know several people not keen on lentils or indeed pulses of any kind which seems such a shame. They work so well in a braise such as this or in soups, cold in salads, in dahls and curries….. Still if they are not your cup of tea I quite understand and believe I may have been slow to embrace them myself. This one I believe is a winner however and, it being the school holidays, my daughter stood over me whilst I took the photograph asking when she could eat it. You can either make this with good pork sausages or as I did today with venison sausages. The gaminess of the latter works a treat with the lentils and I added half a teaspoon of redcurrant jelly to reinforce the sweet flavour of the meat. With the pork version I would be tempted to add a dollop of dijon to my plate. Either way it is a one pot winner, wilted spinach, spring greens or some kale would be a delicious accompaniment. Put one teaspoon of oil in a large pan and brown the sausages, removing them to a plate when done. Add the second teaspoon of oil and soften the onion, leek and carrot for a few minutes until soft. Stir the lentils into the vegetables and then add the wine and stock. Put the sausages back into the pan and then simmer gently for 20-25 minutes until the lentils are done and the sausages cooked though (add the redcurrant jelly here if you are using it – see introduction). This serves two but can easily be doubled.